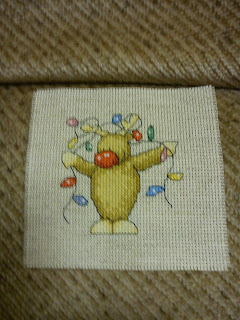 Would anyone like this piece of stitching? I did it a while back for someone else but then they didn't want it so it's free to a loving home anywhere in the world. Please leave a comment if you would like it. If there's a lot of people wanting it then I'll put everyone's names in a hat and draw one. See SO cute and colourful lol! I'm still sorting out my stash but I went through all my mags and charts and my set of drawers. I had already gone through the stash in my wardrobe and sorted all that out a few weeks back so at least that was done. I can now see the floor in my spare room at least! I have done a bit on another old project too. 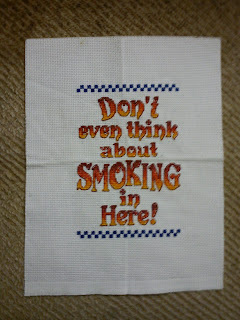 This one is the last in a set I was stitching. 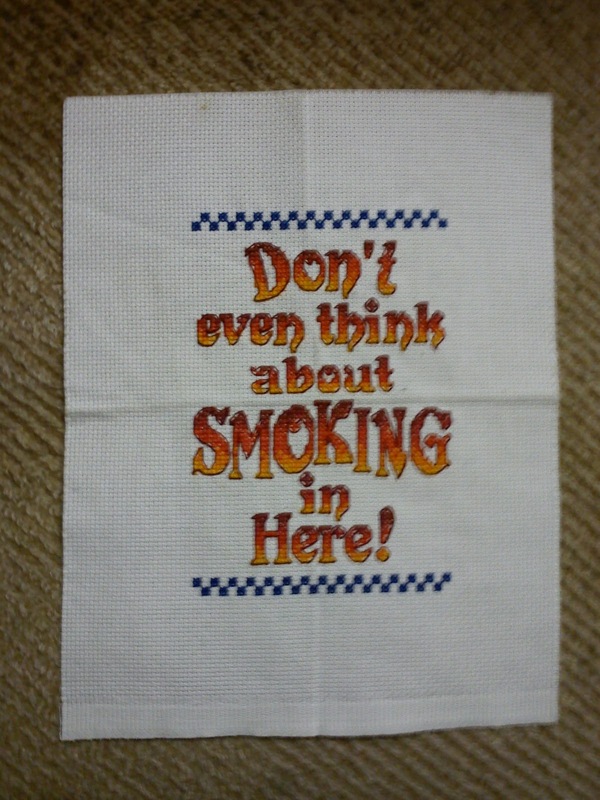 I've stitched it on and off for a few years now. By the time it is finished and sent to the person who it is for, I'm sure it will be a shock! I won't say no more than that or post a pic cos it was meant to be a surprise. I think though I will make this my current WIP to finish it. Just a bit more stitching, some beads and maybe some sparkly threads... then a wash and off it'll go. 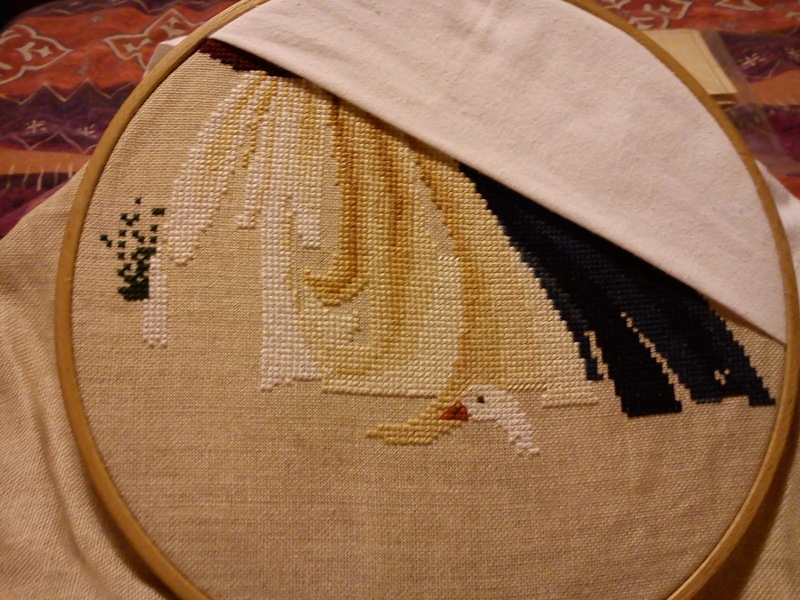 I'm a member of an online cross stitch group on Yahoo! 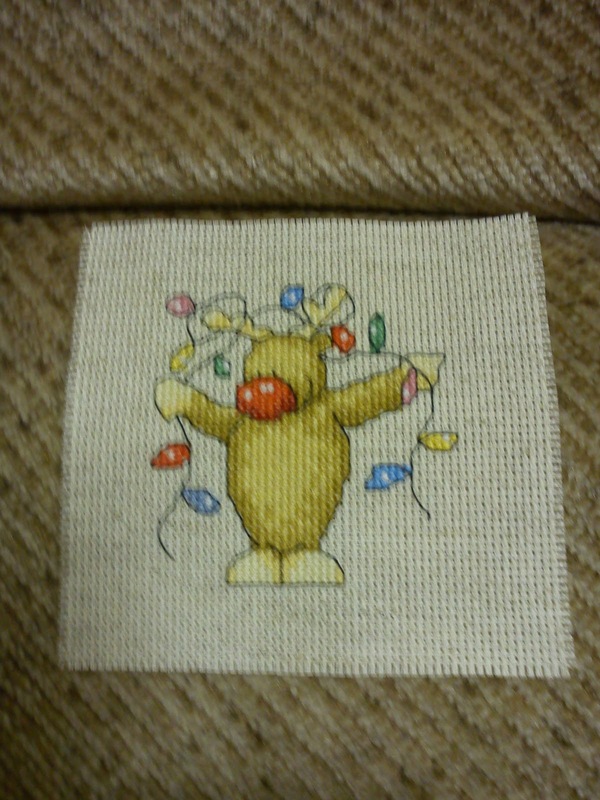 called ILCS ( I Love Cross Stitch) and another member who is new to the group and new to cross stitching posted her first finish this week on her blog Knit Together In Love. I'm sure she won't mind me linking to her blog : ) Well, it looks great for a first timer and I like it so much I'm thinking when I'm rich I'll buy the chart and do it myself! Normally I wouldn't go for anything religious but this is great and so true. 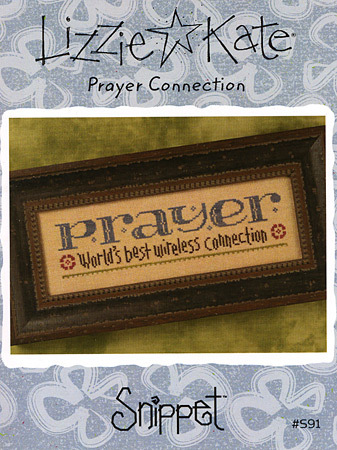 It reminds me of the importance of prayer but makes me smile as well. Thanks for enabling me to expand my wishlist Dianna! It's nearly the weekend and since Craig isn't working I get a nice lie in tomorrow and a chance to get some housework done while he keeps an eye on Seren. I'm on a mission to sort out our spare bedroom since all the junk from every other room has found it's way in there. This is stitchy related since included in the junk is a load of cross stitch magazines and various bits which need sorting! I did start yesterday but didn't get much done. 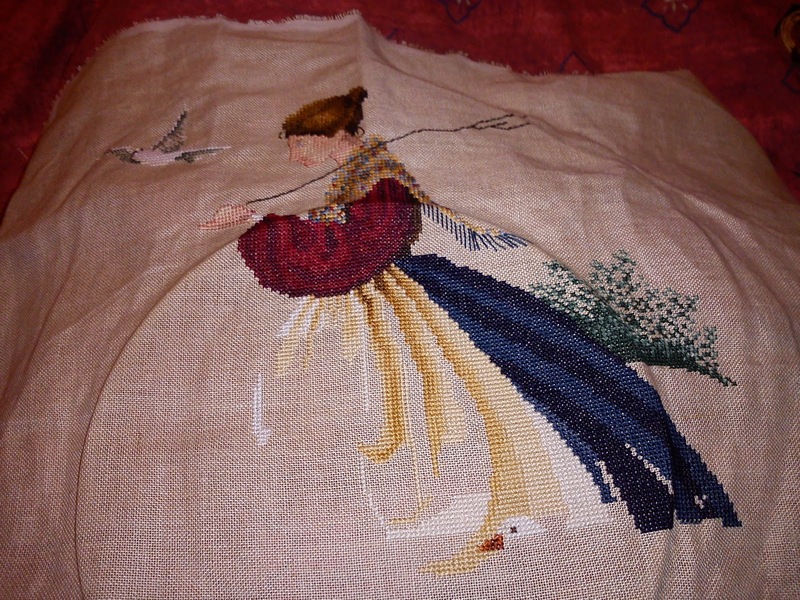 On a stitchy note I've been carrying on with Feathers & Friends though I have another project in my head!! I will resist the temptation to carry that through at the moment! Lots of WIP and pics too! I handed in my childminding registration form on Thursday after a year and a half of work. I finally did it! Now I can spend my evenings doing whatever I like and the only thing I need to feel guilty about is not doing housework!! So I spent most of the weekend either stitching or doing housework LOL! I worked on my Summer Sampler for half the weekend and then changed to Feathers & Friends. I'm starting to get used to my mobile phone software now and got these pics uploaded on my PC in no time today. Yay! I was going to see if I could finish this by December but there's no chance of that so I'm aiming for April instead. I really need to get back into my knitting too. I'm running out of space to keep all the balls of wool especially since I'm getting the Art of Crochet mags too. I'll have to get it all out this week and have a sort out. Saying that I'll be glad when the knitting series ends. I really can't afford it anymore but won't cancel it when I'm already 130+ issues in. I think there's only 10 left thankfully! Some work in progress at last! I decided last week since I'd caught up on some housework and had almost finished my registration form that I would have a bit of me time catching up on some tv and doing some cross stitch. Well I got quite a bit done on Feathers & Friends. I was very good because it was between that and my Summer Sampler but I did that cos I know my mother is nagging about when it's gonna be done. Fair play though she had it sitting in the box not even started for many, many more years than what I've had it to stitch!! Anyways I don't have pics today but I will get onto it soon. Thing is I did so much over the weekend now I'm rushing to finish my form for Thursday!